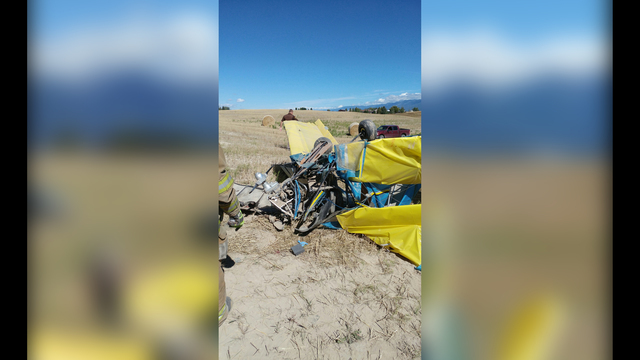 UNREGISTERED ULTRALIGHT, CRASHED IN A FIELD UNDER UNKNOWN CIRCUMSTANCES, NEAR RONAN, MONTANA. RONAN - A small aircraft pilot is in the hospital after his hyperlight plane crashed in a Mission Valley field Friday afternoon. The single-engine SNS8 aircraft crashed just south of Ronan. The pilot was identified as Robert Christensen of Ronan. Christensen was not critically injured. Ronan resident Dave Kauffman happened to be outside before the incident took place. Kauffman says he thought something about the plane's flying pattern was strange, so he kept a close eye on the small aircraft. "I first of all saw the plane flying over the field, and I knew he was fairly low. I watched the plane swing around and head back toward the north, which was my direction,” said Kauffman. “The plane disappeared behind a little hill, I heard a thump, and saw a big cloud of dust and knew the plane was on the ground." Kauffman did not hesitate; He pulled his cell phone from his pocket and immediately dialed 9-1-1. He says crews wasted no time: "Within about eight minutes, the first responders were here,"
When emergency crews responded, they found the pilot pinned inside the wreckage; trapped, but alive, conscious and talking. Lake County Sheriff Don Bell says the aircraft flipped during the crash. They say there was no one else in the plane. Crews were able to free Christensen and pull him to safety. He was then rushed to a local hospital. Kauffman says had the responders not acted as quickly as they did, this story would have ended in tragedy. "It's the time of year when you, we all should really appreciate how those people respond to an accident. They're friends, neighbors, part of the community." Christensen is in stable condition with no life-threatening injuries. Lake County authorities have confirmed that a small plane crashed southwest of Ronan early Friday afternoon. Lake County Sheriff Don Bell tells MTN News a single engine Hyperlight SNS8 aircraft went down shortly before 12:30 p.m. near Songer Road. He reports it was the maiden voyage for the plane. Officials say based on witness reports and evidence on scene, the plane kept losing altitude before hitting an embankment. Sheriff Bell tells MTN News the wing hit the slope, spinning the plane sideways. The aircraft then flipped over on its top, with a single occupant trapped inside. Law enforcement extricated the pilot from the plane on scene, and say he was conscious and taken to a local hospital with unclear injuries. MTN News is receiving reports that a small plane has crashed in Lake County. An eyewitness tells MTN News that he saw a small plane go down in the area of Songer Road, southwest of Ronan. One person was seen being removed from the plane crash site alive. 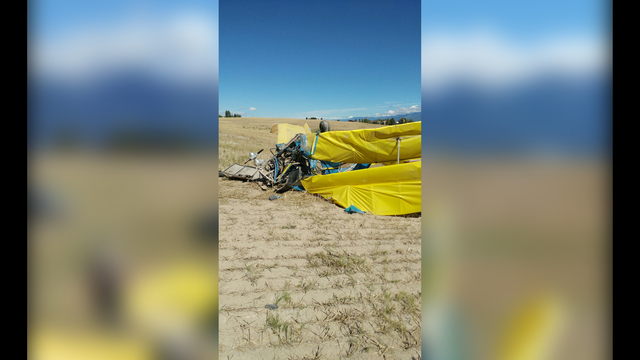 RONAN – A longtime Ronan resident who was taking his small experimental aircraft out for the first time crashed in a rolling grain field southwest of Ronan around 12:30 p.m. Friday. Lake County Sheriff Don Bell said Robert Christensen was conscious and alert in a local hospital a couple of hours after the crash near Songer Road, where Christensen lives. A friend of Christensen watched as the aircraft got lower and lower and finally caught the left wing on a hillside about 1½ miles out of Ronan. The ultralight made mostly of aluminum and plastic spun to the left, sticking the rotor into the dirt and flopping over, sliding on its top for a short distance and leaving the pilot hanging upside down, Bell said. “It wasn’t going very fast on impact,” Bell said. The friend called 911 at 12:27 p.m. and sheriff, ambulance, fire and tribal law and order responded. The man was cut out of his harness and taken to the hospital, where Bell talked to him at around 2 p.m.
Bell said Friday's accident took place several miles to the east of the site of a light plane crash in December 2014 that killed two men. 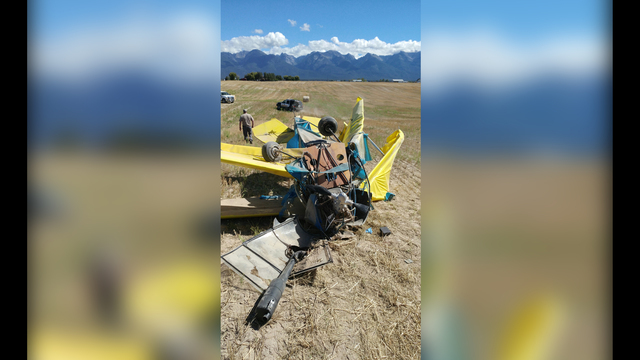 A Ronan man was injured when the ultralight aircraft he was piloting landed hard and flipped onto its top. Lake County Sheriff Don Bell says the aircraft came down in a field near the pilot's home on Friday afternoon. His family witnessed the crash. Bell says it was the first time the man had flown the aircraft. Bell says that the man suffered a cut on his head, but he didn't know what other injuries he might have. He was taken to the hospital in Ronan. Bell says the aircraft was about 18 feet long and 20 to 25 feet wide. RONAN - Lake County authorities have confirmed that a small plane crashed southwest of Ronan early Friday afternoon. Lake County Sheriff Don Bell said a single engine Sorrell Hiperlight SNS-8 aircraft went down shortly before 12:30 p.m. near Songer Road. Sheriff Bell said the wing hit the slope, spinning the plane sideways. The aircraft then flipped over on its top, with a single occupant trapped inside. Law enforcement extricated the pilot from the plane on scene. He was conscious and taken to a local hospital with unclear injuries. AIRCRAFT FORCE LANDED IN THE TREES NEAR THE BLUE CANYON NYACK AIRPORT, EMIGRANT GAP, CALIFORNIA. Fire crews on Friday extricated a glider pilot from trees in the median of Interstate 80, near the Blue Canyon Road offramp. 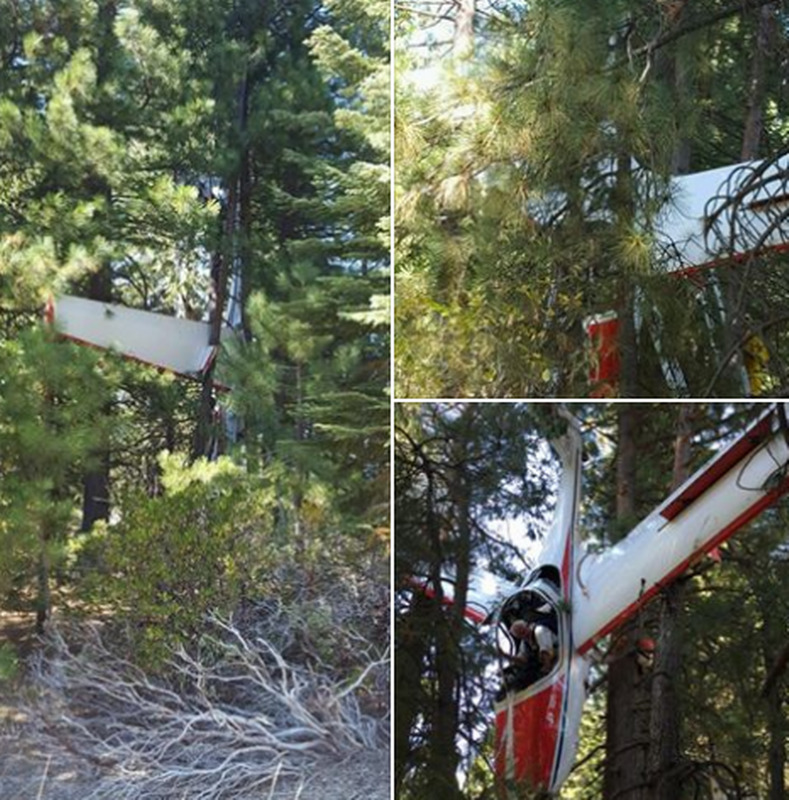 According to the California Highway Patrol, the glider was hanging in trees about 25 feet off the ground. The lone occupant was seat-belted in the glider and reportedly had suffered minor cuts. The aircraft lost power went down shortly after 2:30 p.m. The CHP reported that it took fire crews a while to get the pilot out of the plane and onto the ground, but he walked away with only minor injuries. According to the Federal Aviation Administration, the glider is a Glob Flugzeugbau. The FAA Registry lists the registered owner as Richard L. Pearl of Lincoln. The California Department of Transportation reported that although no lanes were closed, traffic on eastbound I-80 was slow in the area of the crash. The airline transport pilot and three passengers were departing in the multi-engine airplane when, during the early phase of takeoff, most likely shortly after rotation, the right engine experienced a total loss of power. The power loss occurred during a critical phase of flight, at a time when the airplane was close to or just below the manufacturer's recommended "safe single-engine speed." The hilly terrain surrounding the airport, particularly in the takeoff direction, left the pilot with few options for a safe climb out. Further hindering the takeoff was the airplane's anemic single-engine climb performance due to the high density altitude conditions and the airplane's weight. As a result, shortly after the loss of power, the airplane rolled right, consistent with it flying slower than its minimum controllable single-engine airspeed, collided with the ground, and sustained substantial damage. The pilot and passengers all sustained serious injuries and could not remember the circumstances of the accident. Examination of the right engine revealed that a clear, gelatinous substance had blocked the inlet port of the fuel flow transducer, leading to fuel starvation. The substance was determined to be silicone, most likely room-temperature-vulcanization silicone sealant. There were no indications that this material had been used anywhere within the fuel system, nor were there any signs of recent maintenance that could have resulted in the introduction of this contaminant. To get to the fuel flow transducer, the silicone would have had to pass through multiple fine mesh filters, which was unlikely based on the material's size when dry. However, silicone becomes semi-soluble once in contact with aviation gasoline, and it is possible that it was extruded through the filters in this state, and eventually coalesced in the flow divider inlet port. 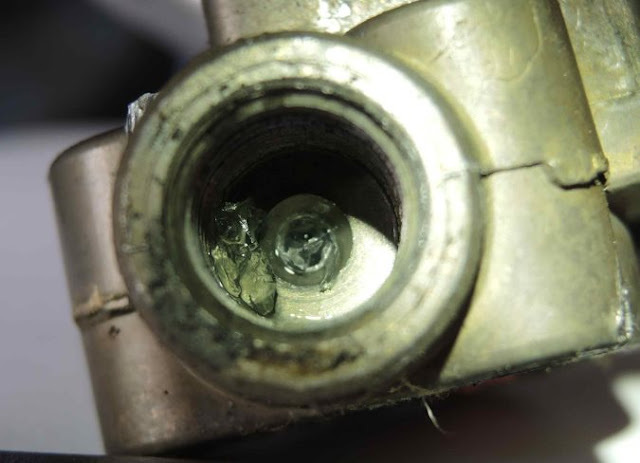 Smaller fragments of the silicone were found in the fuel manifold valve, beyond the flow divider, and a fuel injector valve port was partially occluded, possibly with the same material. The specific source of contamination could not be determined. The pilot last purchased fuel for the airplane about one month before the accident. Later on the day of purchase, the fuel system was shut down by the airport management due to metering inaccuracies; however, the problems were all electrical in nature, and did not require the repair or replacement of any components that would have come into contact with fuel. Total loss of power to the right engine during takeoff due to a fuel contaminant, which blocked the fuel flow transducer and resulted in fuel starvation to the engine. 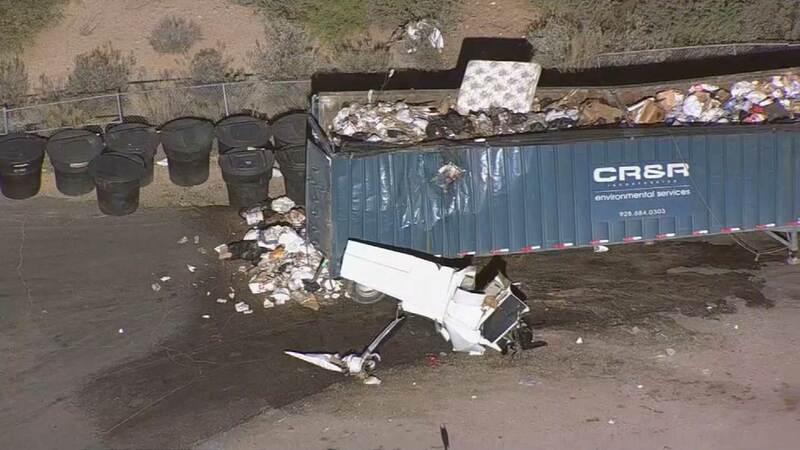 On September 9, 2016, about 0700 mountain standard time, a Cessna 310N, N126P, struck a refuse transfer trailer shortly after takeoff from Wickenburg Municipal Airport, Wickenburg, Arizona. The airline transport pilot and three passengers were seriously injured, and the airplane sustained substantial damage. The twin-engine airplane was registered to and operated by the pilot under the provisions of 14 Code of Federal Regulations Part 91. The personal flight departed Wickenburg with a planned destination of Payson, Arizona. Visual meteorological conditions prevailed, and no flight plan had been filed. Witnesses reported observing the airplane takeoff from runway 23, and veer to the right of centerline shortly after rotation. Having reached an altitude of about 75 ft above ground level, the airplane did not climb, and crossed over the runway verge and towards an adjacent industrial park. A witness stated that a few seconds later, the airplane rolled almost 90o to the right, and the right wing struck the refuse trailer. The right wing separated from the airframe, and the main fuselage came to rest about 75 ft downrange. The airplane came to rest within the confines of the City Sanitation Department, about 2,200 ft beyond the runway departure threshold, and about 30o right of its centerline. The pilot and passengers sustained multiple serious injuries, and were initially treated and stabilized at the accident site by first response personnel. Due to the nature of their injuries, they were unable to recall the circumstances of the accident. The pilot held an airline transport pilot certificate with ratings for airplane multiengine land. He also held an instructor rating for airplane single-engine land, along with type ratings for the B-727, B-757, B-767, DC3, and N-265. He held an airframe and powerplant mechanic certificate with inspection authorization. The pilot's last flight review took place in March 2014, he also reported practicing single-engine procedures in the accident airplane during July 2016. The airplane was manufactured in 1968, and had been owned and maintained by the pilot since 1985. It was equipped with two six-cylinder, fuel injected, Continental Motors IO-470 series engines. The right engine had been overhauled and installed in 1986, and had accrued 690.9 flight hours at the last annual inspection on July 6, 2016. The left engine was overhauled and installed in a Cessna 310N airplane in 1978, and removed and installed on the accident airplane in 1988. It had accrued 1,268.7 flight hours at the last annual inspection. Area winds were out of the northwest at 5 knots, with an altimeter setting at 29. 93 inches of mercury, and a temperature and dewpoint of 25° C and 16° C respectively. The corresponding density altitude for field elevation was about 4,200 ft.
Wickenburg Airport is at an elevation of 2,378 ft, and is composed of a single 6,101-ft-long asphalt runway, designated 5/23. Runway 23 is on a 1.2% uphill gradient. Terrain 1.5 miles beyond the departure end of runway 23 rises to a peak about 300 ft above runway elevation. Highway 60, which is offset about 30° right of the runway centerline, follows the foothills of the rising terrain, about 200 ft below the peak. 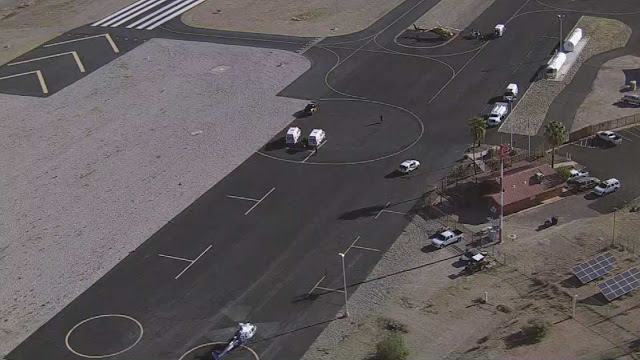 The only fueling facility at the airport was a self-serve pump, managed by the City of Wickenburg. During the period July 16 through 30, the pilot serviced the airplane twice at Wickenburg, and then three times at different airports in Kansas and Wisconsin. The last fuel purchased for the accident aircraft before the accident was from the Wickenburg pump on July 30, 2016. He then flew to Payson, Arizona a few days later. The airport operations manager provided the certificate of analysis for the fuel delivered to the tank farm during that period, and the sample met the tested specifications for ASTM 5191 (vapor pressure), ASTM D86 (distillation), and IP 559 (density). Additionally, daily fuel system facility checks for the month of July and August, did not reveal any anomalies, and no pilots reported issues with fuel. According to the operations manager, the fuel system experienced a failure on July 12, 2016, attributed to a lightning strike, and as a result, the system's computer motherboard was replaced. Metering problems persisted, and on July 30, the same day that the accident pilot purchased fuel, the system was shut down for a week because the delivery meter did not read correctly. The meter's pulse transmitter was replaced; however, anomalies persisted, and in early December, the entire fuel island was shut down for redesign. The operations manager stated that the problems were all electrical in nature, and did not require repair or replacement of any components that would have come into contact with fuel. Toxicological tests on specimens recovered from the pilot after he was admitted to the hospital were performed by the FAA Bioaeronautical Sciences Research Laboratory. Analysis revealed negative findings for ethanol and all screened drug substances except Etomidate, which is an anesthetic agent often used in emergency treatment. Examination of the engine control quadrant at the accident site revealed that both mixture controls were in the full rich position, the propeller controls were 1-inch short of full forward, and the throttle controls had bent to the right and over the quadrant about midrange. Both the flap actuator and landing gear assemblies were in positions consistent with retraction. The left engine had partially separated from the firewall during the impact sequence, sustaining damage to the throttle body and rocker covers, and exposing the valve springs and rocker assemblies for all cylinders except number 4. The propeller blades and hub assembly remained attached to the crankshaft. Both blades exhibited a 15o bend about 12 inches from the hub, along with multiple nicks and chordwise scratches to their leading edges. The fuel lines along with both the engine and propeller controls were intact, and the spark plug electrodes exhibited normal service life wear signatures, and dark grey coloration. The magneto-to-engine timing was correct, and "thumb" compression was confirmed at all cylinders, along with drive train continuity to all valves and accessories. The fuel lines from the metering unit through to the fuel flow transducer and the fuel manifold valve were free of obstruction, and the internal impellor of the transducer could be heard spinning when low-pressure air was applied to the inlet. Disassembly of the fuel manifold valve, engine driven fuel pump, and throttle body metering unit revealed no mechanical anomalies, and residual fuel was observed within the cavity of the manifold valve. The fuel inlet screen was found clear and free from obstructions. During disassembly of the metering unit, debris was observed on the spring side of the mixture control cam. The debris appeared to be a combination of dried grease and ferrous material. The right engine sustained similar impact damage, with the propeller hub assembly remaining attached to the crankshaft. Both blades had detached from the hub, and both were straight, with neither exhibiting any damage signatures associated with rotation such as leading edge nicks or chordwise scratches. Both blades displayed blue streak marks, similar in color to the paint on the refuse trailer which was struck during impact. The engine exhibited comparable magneto-to-engine timing, cylinder compression, and spark plug characteristics as the left engine. Disassembly of the fuel manifold valve, engine driven fuel pump, and throttle body metering unit revealed no mechanical anomalies. However, about 1/8 of one side of the surface of the throttle body inlet screen was covered in lint material, and the fuel injector nozzle for cylinder 3 was partially occluded and coated with a solid glaze. No fuel was observed within the cavity of the manifold valve or the fuel line between the fuel flow transducer and the fuel manifold valve. Disassembly of the fuel lines revealed that a clear gelatinous substance had completely blocked the fuel flow transducer inlet port (metering orifice) (Photo 1). The material was removed, and had a slimy wet texture. After one hour of exposure to air, the material had hardened and took on a texture similar to room-temperature-vulcanization (RTV) silicone. Six fragments were recovered, which, after drying for 24 hours, ranged in size from 1 to 3 mm. Further examination of the fuel manifold valve revealed a similar fragment of the material within the manifold cavity on the pre-filtered side of its screen. The airplane was equipped with a 20-gallon auxiliary fuel tank in each wing, and a 50-gallon main tank at each wingtip. The auxiliary tanks fed the system through gravity, and an electrically driven submerged fuel pump was housed in each tip tank for use during priming and starting, and for backup operation to the engine-driven fuel pump. Each wing housed a combination fuel selector valve/strainer, which was controlled by a selector lever in the cabin via a set of cables. The mesh size of the strainer was 104 microns. The fuel flowed from the strainer to the engine driven fuel pump, and onward to the inlet port of the fuel metering unit, which was protected by a 210-micron mesh filter. Downstream of the metering unit, the fuel passed through the fuel flow transducer, and into the fuel manifold valve, which contained a 210-micron mesh filter. Maintenance records revealed that a Shadin 910502 fuel flow indicating system was installed in 1982, in accordance with supplemental type certificate SA573GL and SE552GL. The fuel flow transducer installed at the time of the accident was a FloScan 201 series (p/n 680501), which according to the engine logbook, had been installed in 1995 as a replacement for the original unit. The transducer inlet and outlet ports used 1/4-inch NPT threads, and the inlet metering orifice was about 0.115 inches (2.92mm) in diameter. Both outboard tip tanks had been breached, exposing their inner surfaces. No debris was observed within the tanks. The auxiliary tanks were intact, and no debris was observed when examined through the respective fuel filler necks. The airframe and engine fuel lines, filter plugs, fittings, and gaskets were examined to determine if RTV sealant material had been used as a sealing medium. No traces of such material were observed. Additionally, the fuel lines within the engine compartment were stiff, almost brittle, and exhibited significant chaffing damage. The owner stated that he had never used RTV silicon to seal any components within the fuel system. Data provided by Continental Engines indicated that the fuel pressure from the engine driven fuel pump to the metering unit was between 28.8 and 31.0 psi when the engine was operating at 2,625 RPM, and 6.5 to 7.5 psi at 600 RPM. The metered fuel pressure at 2,625 RPM varies between 17.8 and 18.8 psi. The rubber-like material was sent to the NTSB Materials Laboratory Division for analysis using a Fourier Transform Infrared spectrometer. The results revealed spectral peaks, which when evaluated, were a strong match to polydimethylsiloxane, also known as silicone. "Do not use for gasketing carburetors or fuel control devices where it will be in constant contact with hydrocarbon fuels. Material will develop excessive swell and loss of mechanical properties." "SAFETY WARNING: Never use RTV or similar sealants when installing Floscan senders or any fuel system components. Sealants can get into the fuel system and cause fuel starvation." The pilot reported the airplanes takeoff weight was 4,900 pounds. The airplane owner's manual stated that for a normal takeoff, the pilot should raise the nose at 90 MPH, break ground at 105 MPH, and allow the airplane to accelerate to the best "twin-engine" rate-of-climb speed of 124 MPH. It further stated that the most critical time for an engine-out condition was during the two to three second period late in takeoff, while the airplane was accelerating to a safe engine-out speed. Furthermore, during an engine-out scenario on takeoff, at a field elevation of 5,000 ft, 4,527 ft is the total distance required to accelerate to 105 MPH, recognize and respond to an engine out-event, and stop the airplane. The manual's "Single Engine Takeoff Distance" chart provided the means to calculate the total distance required to clear a 50 ft obstacle, assuming an engine failure occurred at takeoff speed, and that the propeller was feathered, and the landing gear and flaps were retracted. Under the reported temperature, with a 4-knot headwind, and a gross weight of 4,800 pounds, the distance required would have been about 4,100 ft. Extrapolation of the graph for a gross weight of 4,900 pounds (reported takeoff weight), indicated a distance of about 6,200 ft. At airplane weights between 4,900 and 5,200 pounds (max gross weight), the distance fell beyond the 7,000 ft scale of the graph. The manual stated that under single-engine operation at maximum gross weight, the rate of climb at sea level and standard temperature was 330 ft per minute, with a service ceiling of 6,850 ft. The minimum single-engine control speed was 87 MPH, and the best single-engine angle of climb and rate of climb speeds were 105 and 113 MPH respectively. The manual stated that although the airplane is controllable at the minimum single-engine control speed, "the performance is so far below optimum that continued flight near the ground is improbable. A more suitable recommended safe single-engine speed is 105 MPH, since at this speed, altitude can be maintained more easily while the landing gear is being retracted and the propeller is being feathered." The propellers for both engines rotate in the same direction, with the left engine considered the, "critical engine" during engine-out conditions. On September 9, 2016, about 0700 mountain standard time, a Cessna 310N, N126P, struck a refuse transfer trailer shortly after takeoff from Wickenburg Municipal Airport, Wickenburg, Arizona. The airplane was registered to and operated by the pilot under the provisions of 14 Code of Federal Regulations (CFR) Part 91. The airline transport pilot and three passengers were seriously injured, and the airplane sustained substantial damage. The personal flight departed Wickenburg with a planned destination of Payson, Arizona. Visual meteorological conditions prevailed, and no flight plan had been filed. Witnesses reported observing the airplane takeoff from Runway 23, and veer to the right of centerline shortly after rotation. Having reached an altitude of about 75 ft above ground level, the airplane failed to climb, and crossed over the runway verge and towards an adjacent industrial park. 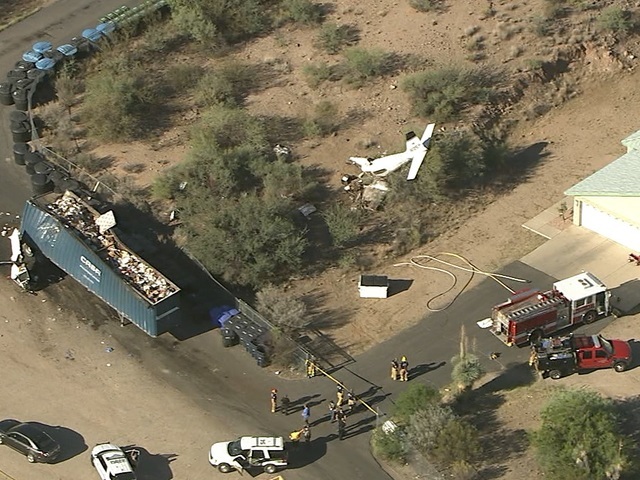 A few seconds later, the airplane rolled almost 90 degrees to the right, and the right wing struck the refuse trailer. The right wing separated from airframe, and the main fuselage came to rest about 75 ft downrange. The airplane came to rest within the confines of the City Sanitation Department, about 2,200 ft beyond the runway departure threshold, and about 30-degrees right of centerline. 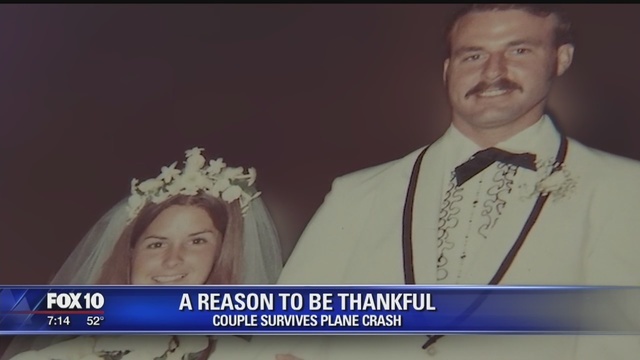 WICKENBURG, Ariz. - One couple has a lot to be thankful for after surviving a plane crash. "Got married in Sun Valley, California in a Catholic church." It was a sweet ceremony on September 9th. "Got out of the service and my mom says, why don't you start dating that little girl down the street. I already had mom's approval." Pat and Linda Brewster tied the knot, then 44 years to the day, who knew they'd be here. "I thank God and Fred the pilot everyday that we made it." 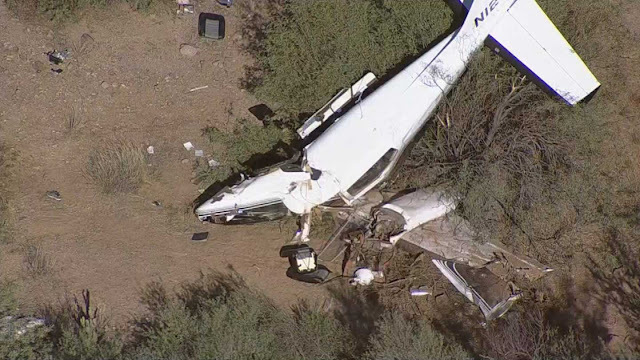 There had been a horrible plane crash near the Wickenburg airport. "We were really looking forward to it. It was our anniversary.. 44th anniversary and going to Payson for breakfast. Our friends, the pilot and his wife had asked us the day before if we wanted to fly and we said, wow, yeah," said Linda. Linda and Pat don't remember much about the crash. 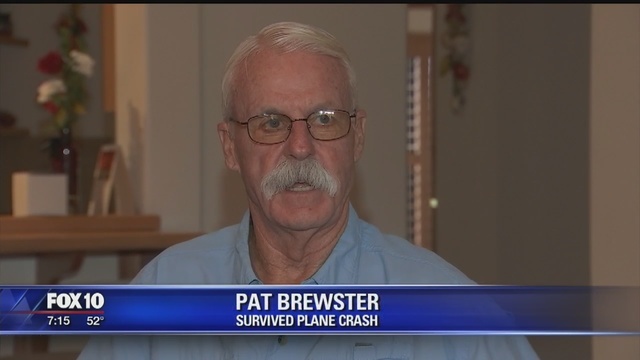 "I sat down in the cockpit and I don't remember taxiing or nothing, we just remember waking up in the hospital," said Pat. "We had lots of broken bones, bruises.. spine, bunch of cracked ribs," said Linda. "I had a broken elbow, broken femur above my knee," added Pat. He says his injuries from the crash weren't much when compared to what he saw as a Los Angeles firefighter for many years. "Most of them were fatal, but this one, for some reason, the big man upstairs decided he didn't want us yet." Firefighters, paramedics, helicopters -- all were quickly on the scene. The four of them in the plane left the Wickenburg airport and didn't make it far. The plane crashed nearby -- and their children and the community came to the rescue as well. "We had 30 days of meals delivered to our house, people we knew, everyone wanted to be a part of helping," said Linda. Linda will wear a brace for a bit longer. Pat will be out of his wheelchair by Christmas. A speedy recovery with lots of well wishes for this active couple in the comforting Arizona town of Wickenburg. "All of our friends caring about us, everyone says if you need any help you call me, and they'll even give the phone number.. they're really serious, we are very thankful, the Thanksgiving we are most thankful for out of any Thanksgiving we've ever had," said Linda. "It was incredible. We were very lucky and thankful." 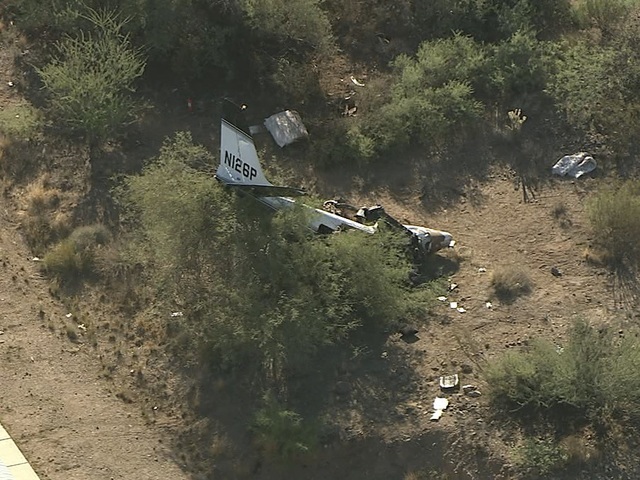 WICKENBURG, AZ - Officials are investigating after a small plane crashed near Wickenburg. The Federal Aviation Administration said the Cessna 310N reportedly crashed a quarter of a mile west of the airport near Highway 60. It went down on departure, crashing in a group of bushes near a structure. Wickenburg police said four people were seriously injured in the crash and taken to the ICU. Police identified the plane owner as Linda Gagliano, but the pilot at the time was Fred Gagliano. 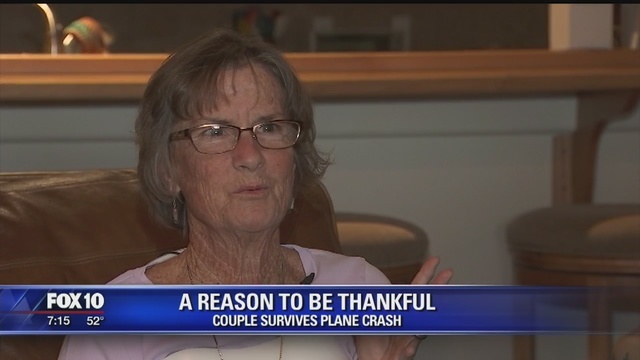 Linda was a passenger, along with two others, Patrick and Linda Brewster. All four occupants are said to be in their sixties. The cause of the crash has not yet been identified, but the FAA is investigating possible mechanical failure. On August 13, 2016, about 1300 eastern daylight time, a Cessna 150G, N3666J, was substantially damaged during cruise flight when the left side of the elevator detached from the horizontal stabilizer. The flight instructor and student pilot were not injured. Visual meteorological conditions prevailed, and no flight plan was filed for the Title 14 Code of Federal Regulations Part 91 personal flight, which departed Montauk Airport (MTP), Montauk, New York, destined for Brookhaven Airport (HWV), Shirley, New York. According to the student pilot, he and the flight instructor were on a dual instruction flight when the accident occurred. They had departed MTP and were on their way back to HMV cruising at 4,500 feet above mean sea level, when the student pilot noticed a roughness and vibration coming through the control wheel. He told the flight instructor about it, and then while looking around the airplane he noticed that the left elevator tip was hanging down 6-10 inches from its normal mounting position. According to the flight instructor, when the student pilot complained that the airplane was handling "funny," he took control of the airplane and noticed that the left elevator was moving up and down uncontrollably. At this point, the airplane was directly in line with runway 24 at HWV, so the flight instructor made a slight power reduction to descend at 150 feet per minute, kept the wing flaps retracted, did not move the flight controls, and made a 7 mile long straight in approach to the runway where the airplane touched down firmly without further incident. Examination of the elevator and horizontal stabilizer by a Federal Aviation Administration (FAA) inspector revealed that the left outboard elevator attach bolt had backed out of the nut plate. Further examination also revealed that the right elevator attach bolt would move in the nutplate when the elevator was moved up or down. According to FAA records, the flight instructor held an airline transport pilot certificate with a rating for airplane multi-engine land, and commercial privileges for airplane single-engine land and airplane single-engine sea. He also held a flight instructor certificate with ratings for airplane single-engine, airplane multi-engine, and instrument airplane. He also held a ground instructor certificate with a basic rating, and a mechanic certificate with ratings for airframe and powerplant, with an inspection authorization from the FAA. His most recent application for a FAA third-class medical certificate was dated January 20, 2015. He reported that he had accrued 8,700 total hours of flight time, 1,300 of which were in the accident airplane make and model. According to FAA records, the student pilot held a student pilot certificate. His most recent application for a FAA first-class medical certificate was dated November 14, 2013. He reported that he had accrued 56 total hours of flight time, all of which were in the accident airplane make and model. According to FAA and maintenance records, the airplane was manufactured in 1966. The airplane's most recent annual inspection was completed on February 1, 2016. At the time of the inspection, the airplane had accrued approximately 2,860 total hours of operation. The elevator attach bolts, nutplates, and bushings, were retained by the NTSB for further examination. The pilot reported that during the landing approach to the grass runway he had ample time to observe the runway surface and the turf appeared smooth and even. He continued the approach and executed a soft field landing. While on the landing roll, he noticed a puddle of water ahead. He commanded full up elevator and attempted to "jump" the puddle, but the airplane had already slowed below flight speed. The main landing gear of the tailwheel equipped airplane struck the standing water that was about 3 inches deep, and hidden by the grass. 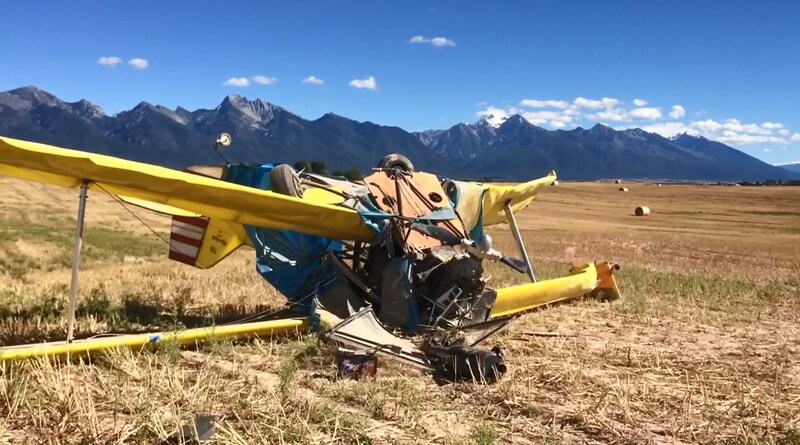 The airplane slowed abruptly and the airplane subsequently nosed-over resulting in substantial damage to the vertical tail, and right wing strut. 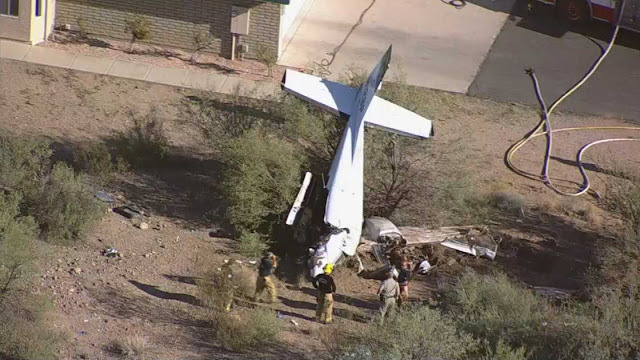 The pilot reported that there were no mechanical malfunctions of the airplane. The private pilot and passenger departed on a night cross-country flight using flight following. About 2 hours after departure, the engine suddenly lost partial power. The pilot checked the engine gauges, which were all in the green, and advised air traffic control (ATC) of the loss of engine power. The pilot switched fuel tanks, then activated the carburetor heat. He tried switching magnetos and enriching the mixture for “a few seconds.” He then leaned the mixture again and “deactivated the carb heat,” all with no changes observed in engine power. The pilot declared an emergency with ATC and used his tablet computer’s navigation application to align the airplane over a road. Upon touchdown, the airplane’s wing impacted a guardrail, and the airplane subsequently nosed over. Although weather conditions at the nearest weather reporting facility about 50 miles from the accident site were conducive to the accumulation of serious carburetor icing at cruise power, the investigation could not determine whether the loss of power was a result of carburetor ice, and no postaccident examination of the engine was conducted to rule out other causes. A partial loss of engine power for reasons that could not be determined based on available information. On September 4, 2016, about 0435 mountain daylight time, a Piper PA 28-180 airplane, N9241J, impacted ground obstacles and nosed over during a forced landing following a partial loss of engine power near Cuba, New Mexico. The pilot and his passenger reported no injuries. The airplane was substantially damaged during the nose over. The airplane was registered to an individual and was operated by the pilot under the provisions of 14 Code of Federal Regulations Part 91 as a personal flight. Night visual meteorological conditions prevailed along the route of flight and the flight did not operate on a flight plan. The flight originated from the Levelland Municipal Airport (LLN), near Levelland, Texas, about 0235 central daylight time, and was destined for the Four Corners Regional Airport (FMN), near Farmington, New Mexico. The flight landed at LLN to obtain fuel and subsequently departed for FMN. About an hour after departing LLN, Albuquerque Center advised the pilot that there was light to moderate precipitation extending approximately 20 miles north of Albuquerque. He observed on an iPad application that the weather was a "non-factor" by the time he reached Albuquerque. The pilot continued the flight northwest and felt the engine suddenly lose power. He checked the engine gauges, which were all in the green. He advised Albuquerque Center of the loss of engine power. The pilot switched fuel tanks then activated the carb heat. He tried switching magnetos and enriching the mixture for "a few seconds." He leaned the mixture again and "deactivated the carb heat." He advised Albuquerque Center that the airplane was not going to be able to maintain altitude and declared an emergency. He used the iPad application map and he aligned the airplane over a road. The airplane's wing impacted a guard rail during the forced landing and the airplane subsequently nosed over. The pilot reported that fuel leaked from the fuel tank caps vents while he and his passenger exited the inverted airplane. At 0453, the recorded weather at the Santa Fe Municipal Airport (SAF), near Santa Fe, New Mexico, was: Wind calm; visibility 10 statute miles; sky condition clear; temperature 16 degrees C; dew point 12 degrees C; altimeter 30.08 inches of mercury. SAF's temperature and dew point were plotted on a carburetor icing probability chart. The plot shows a probability of serious icing at a cruise power settings at the temperature and dew point reported about the time of the accident. On September 3, 2016, about 2240 mountain daylight time, a Piper PA 28-180 airplane, N9241J, impacted ground obstacles and nosed over during a forced landing following a partial loss of engine power near Cuba, New Mexico. The pilot and his passenger sustained minor injuries. The airplane was substantially damaged during the nose over. The airplane was registered to an individual and was operated by the pilot under the provisions of 14 Code of Federal Regulations Part 91 as a personal flight. Night visual meteorological conditions prevailed along the route of flight and the flight did not operate on a flight plan. The flight originated from the Levelland Municipal Airport (LLN), near Levelland, Texas, and was destined for the Four Corners Regional Airport (FMN), near Farmington, New Mexico. The flight landed at LLN to obtain fuel and subsequently departed for FMN. According to initial information given to the Federal Aviation Administration, the airplane lost partial engine power. The pilot elected to perform a night forced landing on a roadway. The airplane's wing impacted a ground obstacle and subsequently nosed over. At 2253, the recorded weather at the Santa Fe Municipal Airport, near Santa Fe, New Mexico, was: Wind 110 degrees at 5 knots; visibility 10 statute miles; sky condition few clouds at 8,000 feet, overcast clouds at 11,000 feet; temperature 19 degrees C; dew point 14 degrees C; altimeter 30.09 inches of mercury.